Transportation engineering is an increasingly global profession. 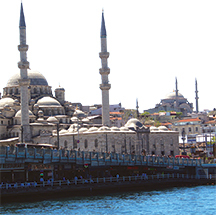 For two weeks in May 2015, Iowa State students are invited to study advanced topics in transportation engineering at English-language Bogaziçi University in magical, metropolitan Istanbul, Turkey. Istanbul is a cultural and entertainment hub and a dynamic center of global commerce straddling the Bosphorus Strait between Europe and Asia. The city is served by a complex, modern transportation network, including two international airports, three shipping ports, a “chunnel,” and a ferry system. While studying Istanbul’s unique transportation system first hand, students will be preparing for future transportation careers in public, private, or academic arenas. And, of course, experiencing Istanbul’s other local attractions: cafés, night clubs, tea houses, a bustling market, art galleries, historic mosques, and more. Four professors from ISU’s Department of Civil, Construction, and Environmental Engineering will accompany the students and share instruction with other visiting professors: Shauna Hallmark, Omar Smadi, Chris Williams, and Halil Ceylan. For cost, credit, and other information, see the short brochure. Additional details and registration information is online. This opportunity is being sponsored by Iowa State’s Midwest Transportation Center and the Department of Civil, Construction, and Environmental Engineering.